The Vileda Mop handle is suitable for use with the Vileda Super Mop Head, it is a strong and reliable mop handle sure to provide many years of effective service carrying a mop head. 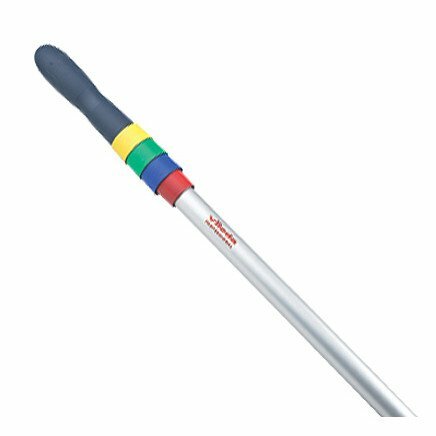 Rather than offering different coloured handle Vileda Mop Handles come supplied complete with four colour-coded clips to allow the user to identify the usage area of the handle that way. Green identifying clip used to signify that a particular mop and handle is only to be used in food preparation and bar areas. Red identifying clip used on mops and handles for cleaning around sanitary appliances and washroom floors. Blue clip for mops and handles used in general lower risk areas (not including food areas). Yellow clip may be used for mops and handles destined for washbasins and other washroom surfaces.